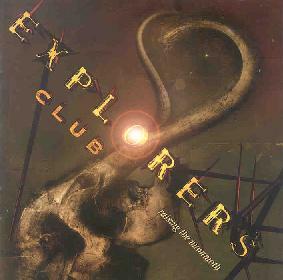 Explorers Club - "Raising The Mammoth"
Essentially Explorers Club appears to be a rotating lineup, with some returning musicians from the "Age of Impact" release, of prog rock/metallers of more familiar strides. The collective of musicians present on the "Raising The Mammoth" release act as instrumental devices etching out their individual perspectives into a broader musical project or series of sonic themes. These themes are a nod to Trent Gardner's idea to basically generate a storyline within the parameters of one lengthy jam. The album is basically one extended piece of songwriting and musicianship that is indexed or tracked at certain points on the CD release. Each indexed portion, clocking in at a roughly guessed average of 2 minutes per track, represents a development within the broader piece. Each segment attempts to be a distinct transition between contextual tracks. In a larger sense, the tracking tends to be rather overdone in some instances. Often times a track begins at a point where it clearly cuts off a part of a preceding piece. The several tracks on the disc were likely created to allow listeners to skim through and find points of interest in the entire body of music so alas 44 tracks on a CD. On a creative level: it finds its mark churning out familiar sounds associated with each musician's related group. This is fine for a familiar and casual listener since it provides stylistic familiarity for those who follow the musicians' peripheral groups. These groups have never been too demanding, sonically or conceptually. The release assumes its position as an amalgamation of a 70s prog rock/metal collaboration, owing its sound plainly to each Explorers Club member and their more well known groups' marked sound. It's a story that travels the lesser-celebrated incarnations of rock music: the ballads, the vocals, Watchtower, but only to do so to give signs of semblance to the line that blurs between heavy metal rock, balladeers and synthesizers of sorts. The second Explorers Club release relives a tale of the heavily produced and often time pretentious attempts at orchestral music that rock musicians have indulged in. Again, these are lesser-celebrated incarnations of rock music that are left up to the listener to decide how they feel about the overall body of work: visionary, nostalgic or nausea?